What Would It Take to Implement Cain’s Gold Standard, Interest-Rate-Wise? Stabilizing the price of gold in US dollars requires adjusting the interest rate (akin to how the exchange rate is managed). Herman Cain’s call for a return to the gold standard would imply that the Fed funds rate would have to be about 15 percentage points higher than it was in January 2000 in order to keep the dollar’s value stable at January 2000 levels — a rate 18 percentage points higher than actually recorded in March 2019. 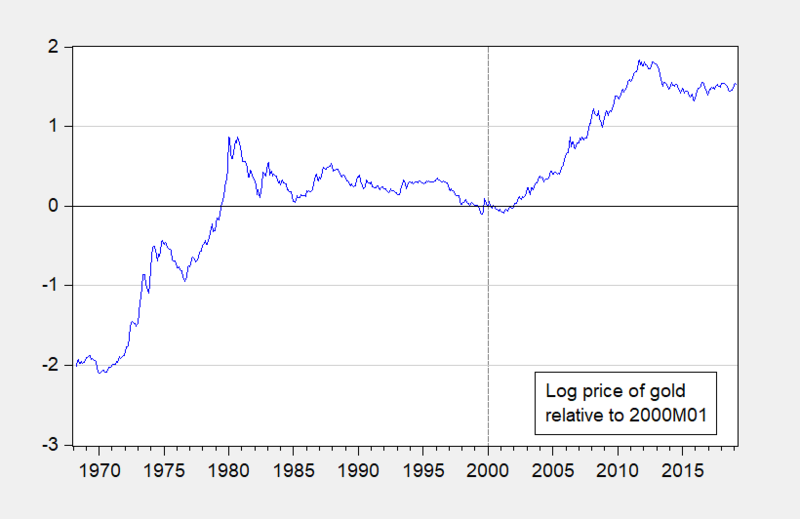 Figure 1: Log price of gold relative 2000M01 (blue). Source: London bullion market via FRED. To figure this out, consider the relationship between the log price of gold and the nominal Fed funds rate, estimated over the 1968M03-2019M02 period. Adj-R2 = 0.17, DW = 0.007 n = 612. Bold figures denote significance at the 1% msl, using HAC robust standard errors. In log terms, the price of gold is 152% higher in March than in January 2000. This implies that the Fed funds rate would have to be 1.52/10.210 = 0.1489, i.e., 14.89 percentage points higher than in January 2000. Instead, in March 2009, the Fed funds rate — which Mr. Trump had decried as being too high — was 3.04 percentage points lower than in 2000. This entry was posted on April 7, 2019 by Menzie Chinn. Dear leader donald trump has tweeted DHS Secretary Kirstjen Nielsen is leaving. She’s a very good sycophant, but not good enough of a sycophant for trump. Last minute training from Stephen Moore on how to play “Simon Says” was not enough to save Kirstjen’s job. Politico has already been theorizing who would be the next immigration czar, my bet is on the nutjob from Kansas, Kris Kobach. Kobach is the same guy donald trump sent on the real witch hunt to purge Democrat voter rolls. Get ready, because if trump gets more than 4-years in office, the next purge of Democrat voter rolls is on the agenda. Meanwhile, Mitch McConnell is sticking his finger inside a bodily orifice and bringing it up to his nose to smell it in some broom closet in the Capital he uses as a “safe space”. Glad her racist and incompetent arse is gone but fearful for what loon replaces her! An extra 15%? That is about the interest rate Trump had to pay to the Russian banks for his loans! Given the volatility of gold prices, picking any fixed price would lead to an insanely volatile money supply. I trust you get the data so one has to wonder why you would endorse such a chaotic monetary policy. Reasoning:	“A dollar should be defined – as it was prior to 1971 under the postwar Bretton Woods system – as a fixed quantity of gold. So maybe he does not want the price to be pegged to the 2000 nominal price but to $35/ounce! It’s too early to say. That I think referred to the effects of the French revolution. Fifteen percent short term rates might have lessened the existential environmental crisis. Instead we have the dominance of the growthers. as accurate, and assume ΔG = 2.6%, and somehow it all winds up in the U.S. If real output grows even at a 2% level (“we’ll have 3% growth!”), this implies an inflation rate of 0.6%, which is far below what is being experienced now. If you actually had 3% output growth, you would have to have deflation, not inflation. I really don’t think the U.S. is ready to become the next Japan. Production up by a mere 2.6% but if gold prices rise, the nominal figure grows by a bit more. Gold prices are highly volatile – which is my big concern with a gold standard. Who knows – a gold standard might lead to high inflation. It all depends on how it is established. Of course with Trump, Moore, and Cain leading this parade, it is likely to be pure chaos! But here’s the thing – Putin’s Russia will become the big winner so for Team Trump it is going as planned! I hope it will not be taken amiss if I respond to this comment. The classical gold standard was not just having gold as legal tender, in which case the price fluctuation of gold would matter, as in pgl’s argument, but also having a fixed exchange rate between gold (at a certain weight) and the dollar or the pound. I have made myself a Cassandra calling out in the wilderness to state that inflation, not unemployment, will be what this administration brings, at least at first, and I stay by that. It may be useful to ask Herman Cain exactly what he means by “the gold standard”, since it will become popular if there is inflation. Well said. Alas when Cain is asked your excellent question – me thinks he will have no clue how to answer it. Julian, FYI, I’m an academic economist who admires the performance of the classical international gold standard and also accepts the truism that is the equation of exchange (whether in levels or in growth rates). It’s true that years of high real growth under the classical gold standard were years of mild deflation. But it was a benign deflation. Output was growing rapidly, after all! Cain shows consistency. If there is a Dem in the WH, then it will be the gold standard and interest rates will be high. But it is Trump (or maybe another GOP), while gold may set the value of the currency, interest rates will be low, at least in the year or two in front of reelection campaign year. I am fascinated by the idea that the gold standard is anything but a pretty rocks standard. Currency can be anything, and tying currency to something specific, like gold, is all fine and good so long as the supply of that specific something can expand with the size of the economy. There are Bitcoin “miners” who expand the supply of that currency, in what I consider a somewhat bizarre and arbitrary way, but my opinion doesn’t matter all that much. I don’t understand the fascination with the gold standard on the right, unless it’s just some kind of long-standing urge to undo everything FDR did and take us back to some kind of pre-Great War economic system. Excellent point. I’m all for a beer standard! That is not at all how the classical gold standard worked. Look at the historical record of the classical gold standard, and tell me whether you ever see the Bank of England having to use 15 percent interest rates. The United States between 1879 and 1913 remained on the gold standard without a central bank. So having a central bank adjust the interest rate can hardly be a requirement for keeping the dollar at its par with gold.